K-pod is the smallest of three pods belonging to the endangered Southern Resident Killer Whale population. While these whales can be seen during our whale watching season, the K-pod is often the last pod to show up in the Salish Sea during the spring and summer months. The Southern Residents have a strict diet of fish with Chinook salmon being their favourite food to eat due to their large size and high fat content. Even though the three pods cannot travel as one large unit all of the time due to food availability restrictions, they will at times meet up for what is known as Superpod. Superpod events are full of socializing, mating and lots of chatter that can be picked up using our onboard hydrophones. Sequim is a successful mother with three living offspring. Her oldest daughter is named Sekiu (K-22), her son’s names is Rainshadow (K-37) and her youngest is a girl named Saturna (K-43). 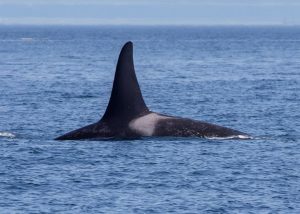 Sequim is also grandmother to Tika (K-33). Sequim was known to have a close relationship with now deceased Ruffles (J-1) who fathered many of the Southern Residents alive today. Sequim was named after a Makah First Nations village on the Olympic Peninsula of Washington. 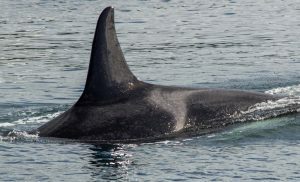 Lea is recognized by the pointy tip of her dorsal fin that resembles a Transient orca’s dorsal fin rather than the rounded tip of most Residents. Her dorsal fin also has a small nick near the top that helps with identification. Leah has successfully raised three offspring. Her son Lobo (K-26) was first in the family, followed by her first daughter Yoda (K-36), and then Kelp (K-42). Lea is not likely to produce any more offspring. Opus is the younger sister of Lea (K-14). She has only ever had one calf survive, a male named Sonata (K-35) who was born in 2002. Opus has a distinctive black shape in her saddlepatch on her left side, but this mark is absent from the right-hand side. Opus and Sonata seem to have adopted Cappuccino (K-21) into their family since Cappuccino no longer has any immediate family members. Spock was named after the T.V. show character Spock from Star Trek. 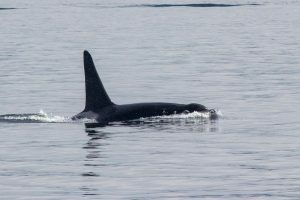 Researchers thought that Spock was male because her dorsal fin has a fairly straight trailing edge, much like male orcas. Spock is part of a large matriline with her brother Scoter (K-25), sister Deadhead (K-27), and younger brother Cali (K-34). Spock has one living offspring named Comet (K-38). Spock is one of the most recognizable K-pod whales because she has a very large and prominent boomerang-shaped opening in her saddlepatch on both sides of her back. Cappuccino was once the only mature male in K-pod for many years. He is now being joined by several younger males who are reaching maturity in K-pod. Cappuccino is well known for being best friends with his sister Raggedy (K-40) who passed away in 2012. Whenever we would see one surface, the other was bound to pop up nearby. Cappuccino struggled to find his place after Raggedy’s death, but is now seen traveling close to Opus (K-16) and her son Sonata (K-35). Cappuccino is one of the easiest Southern Residents to identify on the water. He has a giant triangle-shaped black opening in his saddlepatch on both sides and a large nick in the trailing edge of his fin about ⅓ the way up from his back. Sekiu has only one living offspring, a son named Tika (K-33), who was born in 2001. Sekiu is the eldest offspring Sequim and like her mother, she is named after a location on the Olympic Peninsula of Washington. 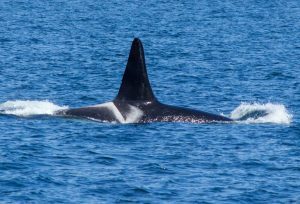 The right side of her saddlepatch is very similar to that of Spock (K-20), but they are easy to tell apart because Sekiu’s dorsal fin is curved and Spock’s is very straight, resembling a mature male’s dorsal fin. Scoter is a mature male in K-pod, easily identified by his broad-based dorsal fin that is not as tall as other mature males. 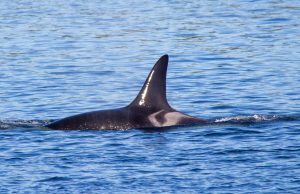 Scoter is the son of Skagit (K-13) who passed away during the winter of 2017. Scoter’s physical health has deteriorated since his mother died. Female orcas share 90% of everything they catch, so without his Mom he is having to forage even more for himself. Scoter has two sisters named Spock (K-20) and Deadhead (K-27) and a younger brother is Cali (K-34). He is the uncle of Comet (K-38) and Ripple (K-44). Lobo is the oldest living offspring born to Lea (K-14). The death of Lobo’s two older siblings caused Lea to be very protective over him for a long time. He has two younger siblings, his sister Yoda (K-36) and his little brother Kelp (K-42). Lobo is easy to pick out when we come across K-pod because he has a very tall, straight dorsal fin that is very rounded at its tip. Deadhead was named after Jerry Garcia, the lead vocalist and guitarist for the band The Grateful Dead. Deadhead lost her mother Skagit (K-13) during the winter of 2017. Her older sister is Spock (K-20), her older brother is Scoter (K-25) and her younger brother is named Cali (K-34). Her son Ripple (K-44) was born in 2011 and she stays very close to him. She also has a nephew named Comet (K-38). Deadhead is often seen near her siblings but is not easy to identify because she has a very plain saddlepatch on no nicks in her dorsal fin. Tika has now started to sprout a tall dorsal fin as he is becoming a mature male. When we see him on the water, he reminds us of Crewser (L-92) who passed away in 2018. It is uncanny how similar their dorsal fins were shaped. Tika is the only living offspring of Sekiu (K-22). His uncle is Rainshadow (K-37) and his aunt Saturna is nine years younger than he is! 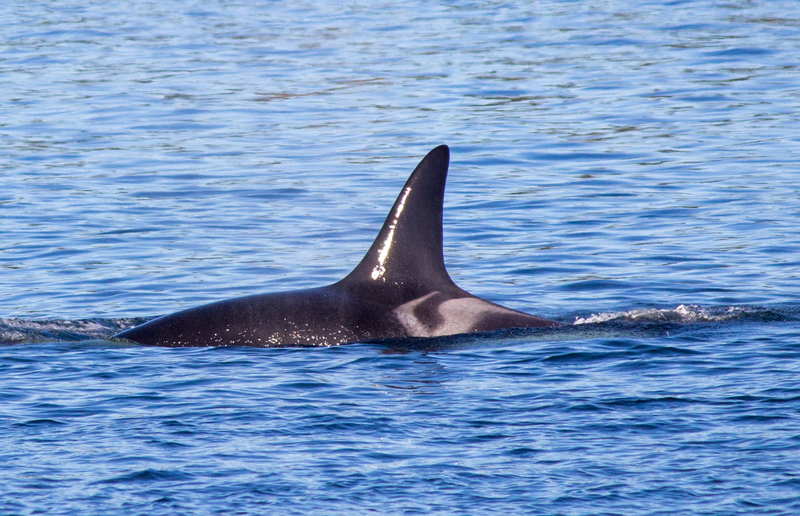 Tika’s grandmother is the oldest female in K-pod, Sequim (K-12). His name means “swift” in Chinook First Nations language. Cali is another “sprouting” male in K-pod whose dorsal fin is growing taller and straighter with each passing season. His name means “heart” in the Coast Salish First Nations language. Cali is the youngest offspring of Skagit (K-13) who died in the winter of 2017. His older brother is Scoter (K-25) and his two older sisters are Spock (K-20) and Deadhead (K-27). He has two nephews named Comet (K-38) and Ripple (K-44), who like to be around their uncle. Sonata is the only living offspring of Opus (K-16). He and his mother seem to have adopted orphaned Cappuccino (K-21) into their tight-knit matriline. Cappuccino is a perfect role model for a maturing young male like Sonata. 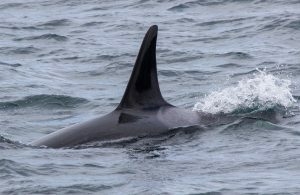 His dorsal fin has grown tall, tapering towards the top and has a pointier tip than other mature males in the population. Yoda is the daughter of Lea (K-14) and sister to Lobo (K-26) and Kelp (K-42). Their matriline is often spotted traveling close to Opus (K-16), Sonata (K-35) and Cappuccino (K-21) as Opus and Lea are sisters. Yoda has a small, black opening at the top of her saddlepatch on both sides of her back. Rainshadow has grown into a spunky personality and he has started to sprout a taller dorsal fin as he has entered puberty. He is the son of Sequim (K-12) and brother to Sekiu (K-22) and Saturna (K-43). The left-hand side of Rainshadow’s saddlepatch is very similar to the left-hand side of Cappuccino’s saddlepatch however, Rainshadow has a grey saddlepatch while Cappuccino’s is bright white. The right side of their saddlepatches are very different. Comet is the one and only living offspring of Spock (K-20). Like podmate Rainshadow (K-37), he has entered puberty and has started sprouting a taller dorsal fin. Comet is part of a tight-knit family with his uncles Scoter (K-25) and Cali (K-34), and his Auntie Deadhead (K-27). He has a young cousin named Ripple (K-44) who looks up to Comet and Cali. 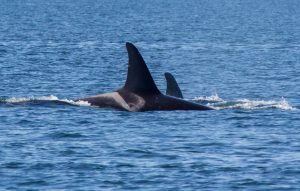 Although Kelp is the fifth offspring born to Lea (K-14), only himself, his brother Lobo (K-26) and his sister Yoda (K-36) are alive. Kelp has a plain, grey saddlepatch and it looks like his dorsal fin will be tall and narrow as he matures, similar to his big brother’s dorsal fin. Saturna has an older sister named Sekiu (K-22) and an older brother named Rainshadow (K-37) who she adores playing with. Her mother is Sequim (K-12). Like her mother and sister, Saturna has wispy black markings along the ridge of her back and at the top of her saddlepatch. It almost looks like someone has painted all three of them with a paint brush! She was named after Saturna Island. Ripple is the only offspring of Deadhead (K-27). He has two uncles to look up to- Scoter (K-25) and Cali (K-34). He also has an aunt named Spock (K-27) and a cousin named Comet (K-38). This large family group tends to travel close together. Ripple is known for having two notches at the base of his dorsal fin which will likely become more prominent as he ages. He also has black hook-shaped openings in his saddlepatch on both sides.